Mosztbacher Henrik ascendants, click to enlarge. Bitter Magdalena ascendants, click to enlarge. 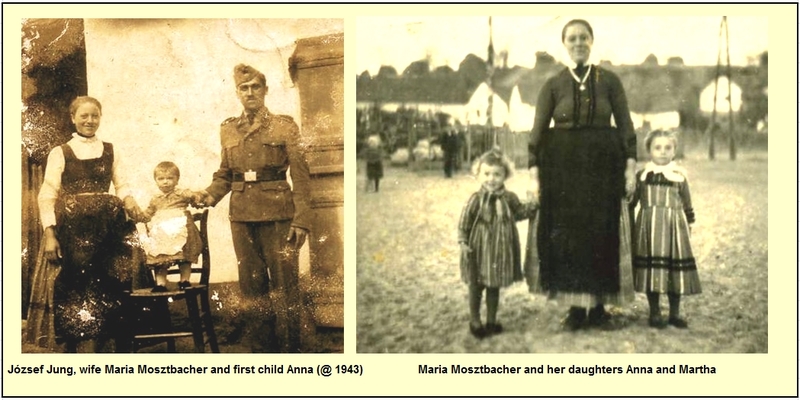 Henrik Mosztbacher parents were: Miklos Moszbacher and Anna Martin Oberritter. Henrik was born in Máraza the first of July 1874. He married Magdolna Bitter in 1894. Magdolna was born the 21st of May 1875. 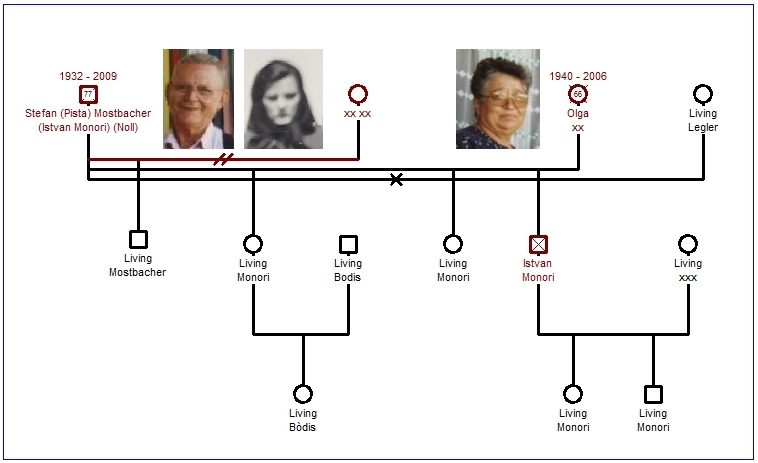 Moszbacher Bitter genealogical tree, click to enlarge. Henrik and Magdolna had 12 children. József, the eldest sibling, was born the 24th of July 1894. Borbála was born the 3rd of May 1899 and passed away 2 months later, the 2nd of May 1899. János was born the 14th of February 1902. Térez was born the 5th of May 1911 and she passed away 5 days later, the 10th of May 1911. Henrik was born the 7th of November 1895. He was single. József was born the 11th of September 1897. Erzsébet was born the 11th of April 1900. She married György Reger the 16th of June 1919. Gyorgy was born the 29th of November 1895. His parents were Vilmos Réger and Magdolna Spengler.Erzsébet and György had three children : István, Mária and Vilmos. 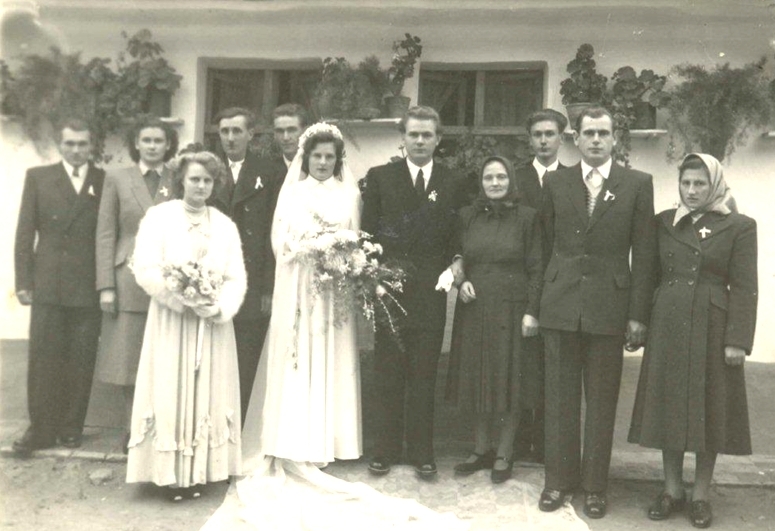 Borbála was born the 15th of November 1904.She married József Bergauer. They had two daughters, Anna and Genovéva. János was born the 7th of August 1906 - See Moszbacher-Noll tree. Miklos (Nicolaus) was born the 10th of October 1908 and passed away in 1959. He was single. Anna was born the 19th of July 1912. She married János Ábel and had 2 children: József and Mária. Anna passed away in 1994. Moszbacher Noll siblings, click to enlarge. János Moszbacher was born in Máraza, the 7th of August 1906. They married and had 6 children. At Christmas 1944, during WW2, János got arrested in Russia and the 29th of August 1945, he died there (or hunger) in the Punisment Camp (Gulag) in Kamenszk (captured ID-Number can be seen on Document as Number 35433). Johann - See Moszbacher Ternes tree. Both photos are so nice that I can not choose one of them, so both are here for you to enjoy. 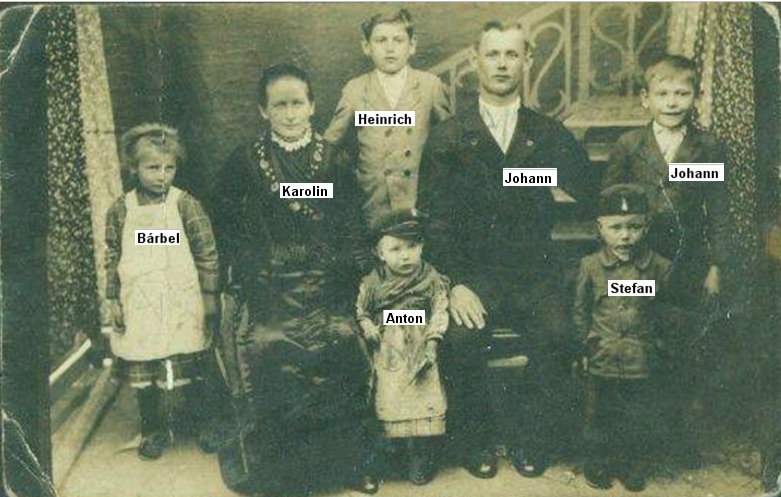 Johann and Karolin family photo 1, click to enlarge. Picture must have been taken around 1935. Jószef, the youngest sibling was not born yet. Johann and Karolin family photo 2.jpg, click to enlarge. 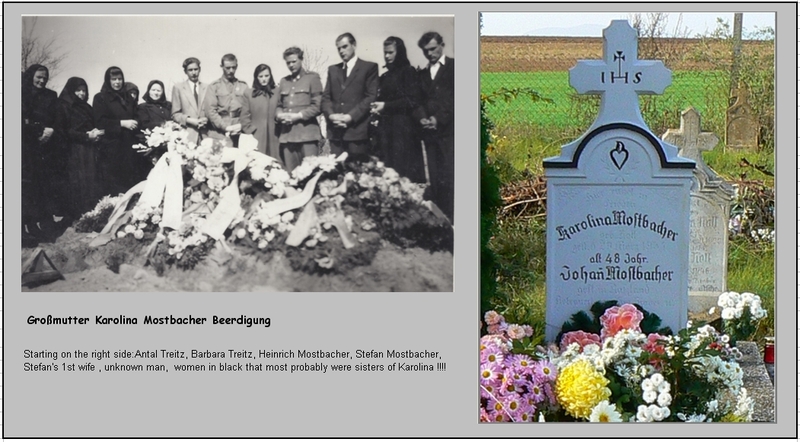 Karolin passed away in Maráza, where she is buried, the 30th of March 1954. Lissi Neni (Elizabeth Spengler) told Maria about her grandma: " She was a very proud woman, had beautiful hair, could sing and make the best bread in village"
Henrik, born 1925 and died 1988. As well as his brother Johann had to go to military, to be a soldier : they had no choice, it was compulsery. He married and had an only daughter (married) and two grandsons. If his descendants enter this Website (or either Cousin Maria show it to them in her next visit to Hungary) I will gladly include more data about them and also photos provided by them, if they allow me and want me to. 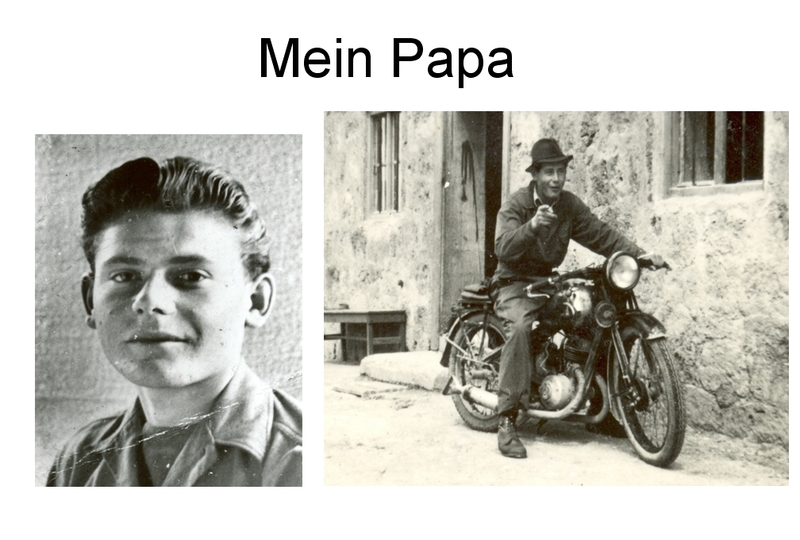 Mein papa.jpg, click to enlarge. 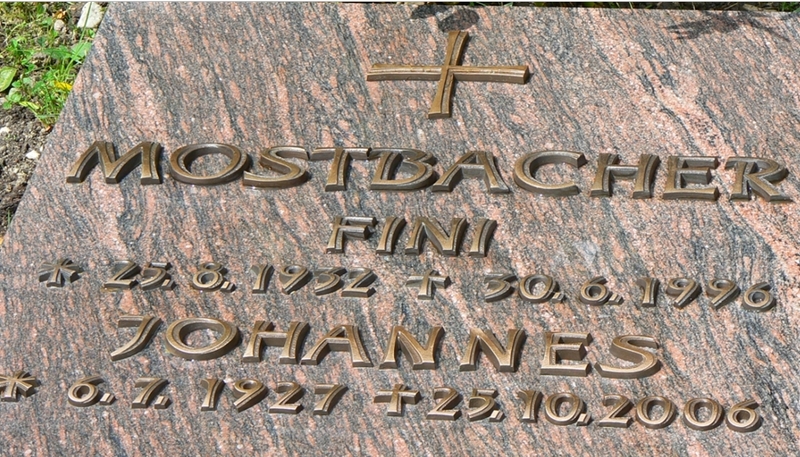 Johann (Cousin Maria's father), was born 6th of July 1927 and died of cancer the 25th of October 2006. His daughter Maria says said that her daddy told her, that he was born in Maráza, in a family where the mother loves to sing, the parents were farmers and that they have been a big family. When he was 16/17 years old, because of World War II, the father had been taken away to Russia and her daddy and his eldest brother were involved in the war. So he had a very bad youth - being arrested by the Americans until end of war. He was in Germany and he tried to go home at once, to see his family again. But at reaching Pecs, a sister of his mother told him, he should leave the country Hungary at once, because in other case he should be arrested at once because of Hitler and being a part of this cruel war. Johann returned to Germany at once and couldn't see his mother, his sister or his brothers. At Germany he started to work and build up a new life. With the help of the Red Cross, Johann found his aunt Margit Noll and his cousin Lissy Werner, living in Oberauerbach, a small village near Zweibrüken, in West Germany. When in the year 1954, his mother died of cancer, he was not able to go to the funeral, as in those years you couldn't go from Germany to Hungary because of the "Cold War". In 1955, he married Rufina (Fini)Ternes Müller. Lissy's husband, Andreas Morschauser was building a house and in the second floor, moved Johann and Fini. There, their first daughter, Maria, was born, the 1st of May 1956. Lissy Neni was her godmother. As Maria recalls, her aunt had a lot of animals (pigs, hens, ducks) that was like a paradise for small children. When Maria was 2 years old, her father had an accident (was in a motorcycle with a friend) and nearly loose his arm. From the assurance company he got a sum of money and bought a farmer-house with a little forest and a lot of country in the same village they were living. 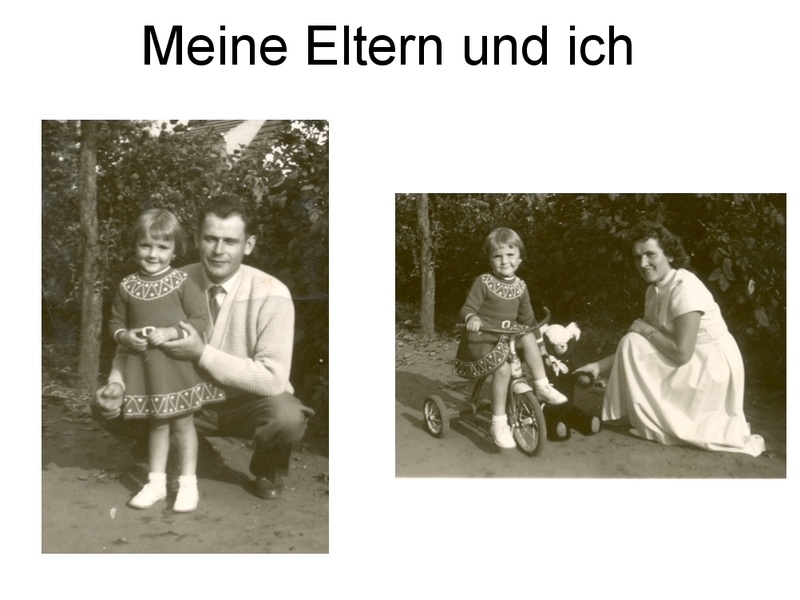 Meine eltern und ich, click to enlarge. Ten years later, Johann and Fini had a second daughter. Maria married in 1974 and had two children. She divorced in 1990. 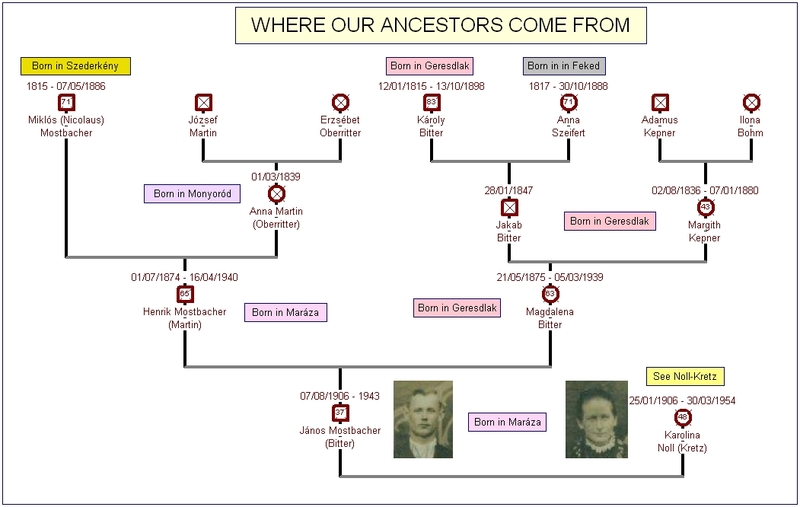 Maria genogram.jpg, click to enlarge. The 30th of June 1996, her mother passed away. She is buried in Wassenburg. 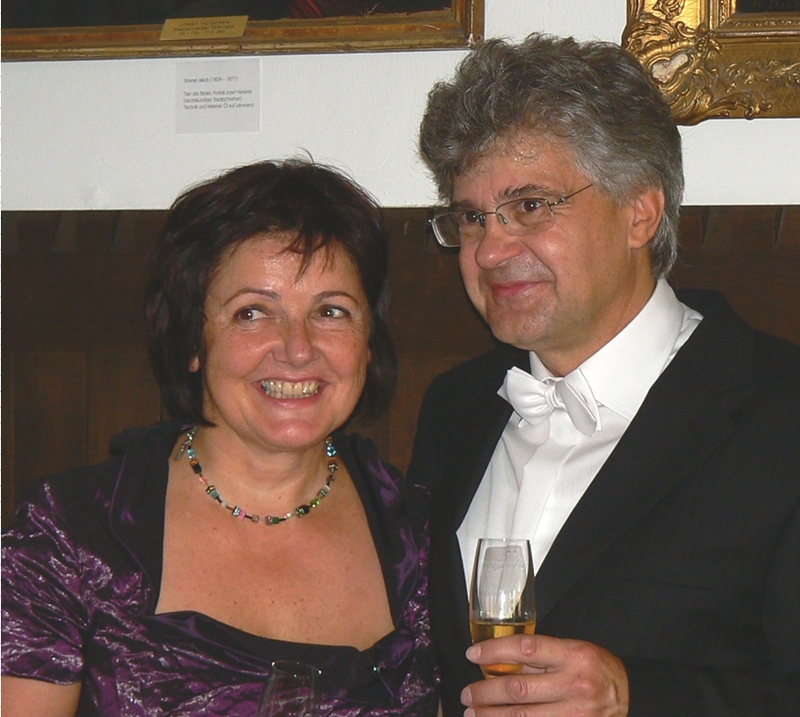 The 24th of July 2009, Maria married her 20 years sweetheart Hubert. Maria and Hubert on their wedding day. As today, 2nd of March 2016, Maria is happily married, had a son married and a beautiful godson, and also a daughter that we had the pleasure to received at our home last year and get to know each other. Rufina (Fini) Ternes was born in Karamurat, Romania, the 25th of August 1932 and passed away the 30th of June 1996. The Ternes came from Konstanza (Black Sea) and some went to Odessa (Russia. According to Cousin Maria, her uncle was a famous professor of theology /catholic. He wrote a book about the people who went from Germany to Romania in the 17th century, wrote about their life at the coast of the black sea and their return by 2nd World War. The book is called "Ostdeutsches Schicksal am Schwarzen Meer" from Dr Johannes Florian Müller in the year 1981. Maria also told me that she can describe the family tree of her mother until the year 1776. I had these data and should anybody be interested, you can write to me at : geno@gorfain.com. Also, their data can be seen in the Krasna Master Census (1814-1940), or in the "Germans from Russia Heritage Collection"
Krasna, Krasnoe, is a village near Odessa, at the Black Sea, that was founded by German settlers. Ternes Müller siblings, click to enlarge. Alosius Ternes ascendants, click to enlarge. 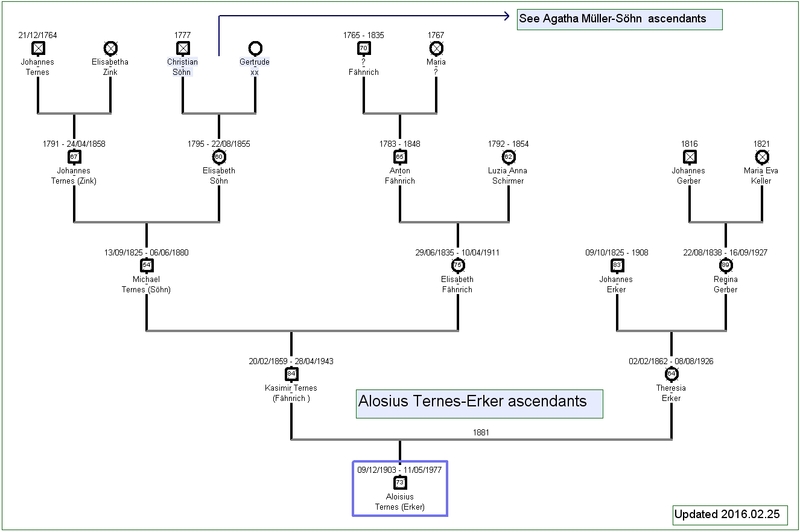 Agatha Müller ascendants, click to enlarge. The only girl of Karolina and Johann Mostbacher is living in Hungary. She married there with Antal Treitz and became a widow with two small children when her husband died because of a car accident. Stefan (Pista), was born in 1932. He changed his surname to Monori and became then Istvan Monori. He married and had a son from that marriage. Have no data about his first wife and/or his son. Only that Cousin Maria saw him in his father burial. He married again to Olga, (1940-2006). My cousin Betty and her daughter were at their place when visiting Hungary. They had two children: a girl (married and with a daughter) and a boy, Istvan, also married and with two children. Istvan passed away. Being a widow, he married a third time with a German lady that survived him. She is living in Maráza. Pista, passed away in Maráza, the 4th of April 2009. Monori Istvan geno, click to enlarge. Stephan was born in 1932 and passed away in 2009. He had a son from his fist wife. He married a second time with Olga (1940-2006), with whom he had two children both married and with children. Once widow, he marrieda German lady, that survived him and is living in Maráza. Monori Istvan first marriage, click to enlarge. Married, living in Maraza, one son, two grandaughters. Jöszef was born in 1939. He was married to Erzsi and both were living in Maräza. They had a daughter, named Eva, that was born the 13th of November 1968 and passed away the 13th of November 1910. She was married with two sons. 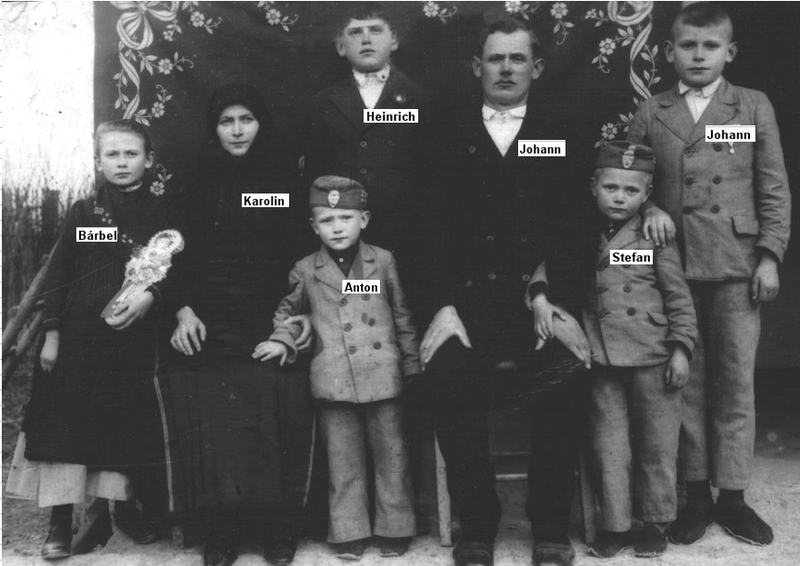 Joszef and Erzsi also had 2 sons and grandchildre.One of them is still living in Maraza, in Karolin Noll home. 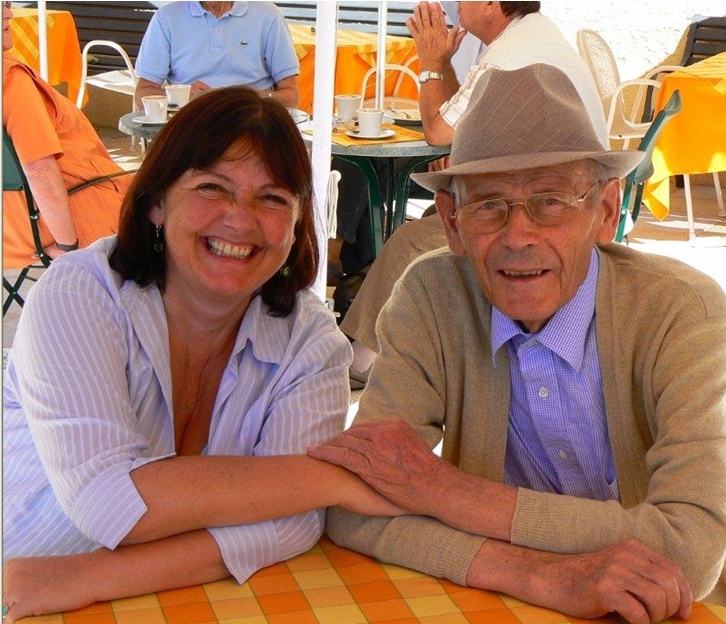 Joszef passed away the 22nd of June 2014. His wife passed away the 30th of January 2013. Mostbacher Jószef, click to enlarge. How we are related, click to enlarge. 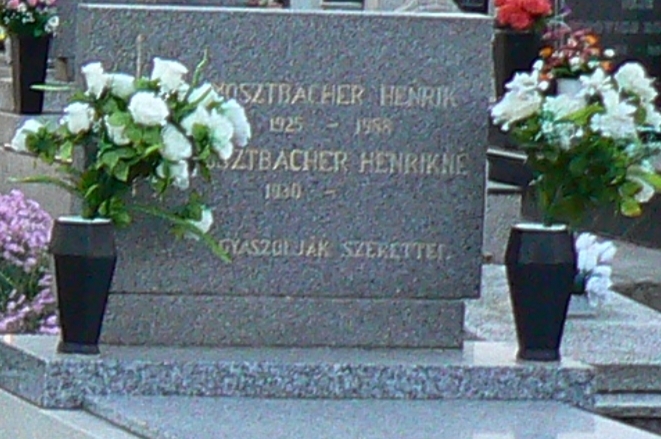 József Mosztbacher Bitter was the 4th child of Henrik Mosztbacher Martin and Magdalena Bitter Kepner. He was born the 11th of September 1897. Maria, born the 1st of November 1921 and died 10 days later. Maria, born the 3rd of May 1925 and died 8th of September 1998. Mária and Térez: please check the following genograms and let me know if they are correct, if you want anything change or included.My email = geno@chasque.net. Jung Mosztbacher genealogical tree, click to enlarge. Szollosi Jung genealogical tree, click to enlarge. 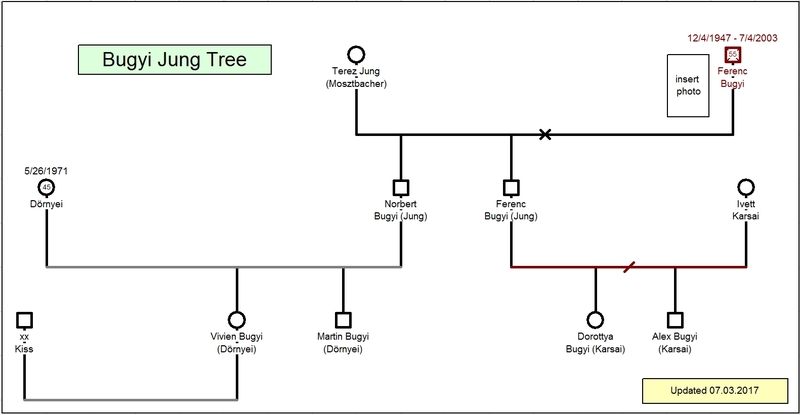 Bugyi Jung genealogical tree, click to enlarge. Jung plus Toth Mosztbacher genealogical tree, click to enlarge. Doho Jung genealogical tree, click to enlarge. Szondi Jung genealogical tree, click to enlarge. 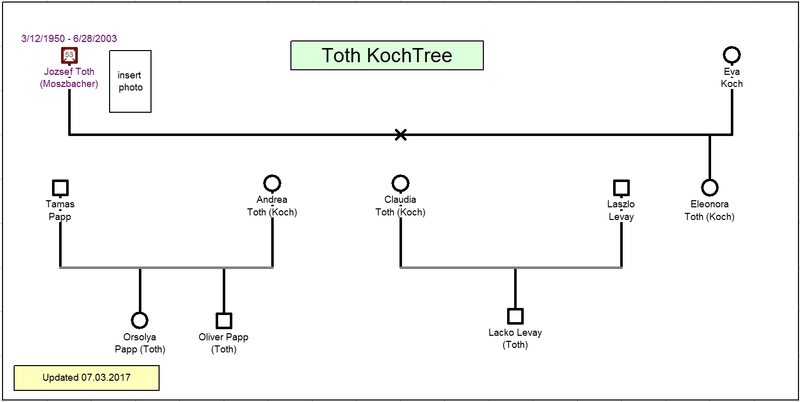 Toth Koch genealogical tree, click to enlarge. 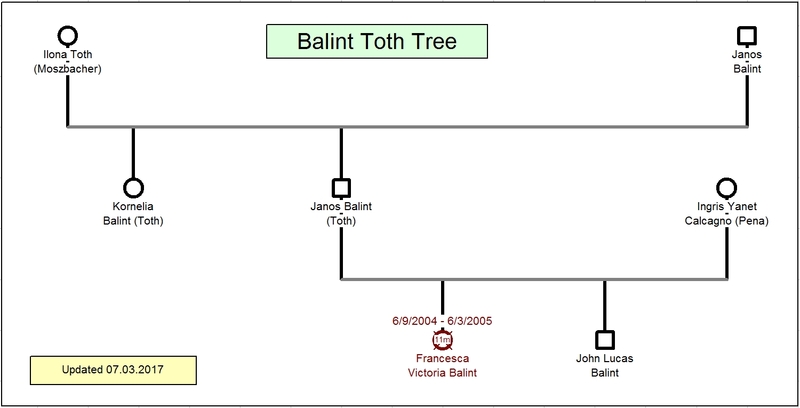 Balint Toth genealogical tree, click to enlarge. Also I will be awaiting to put a name to every person of the beautiful photos Maria sent me.Let me know which I should upload.